This story was updated on Feb. 11. The holiday is season is long over, but you can still find plenty of reasons to celebrate during the 28 days of February, from the Super Bowl (Feb. 3) and Lunar New Year (Feb. 5) to Valentine’s Day (Feb. 14) and National Margarita Day (Feb. 22). While some of these holidays are manufactured for sure, the freebies and discounts they trigger are real. Below you’ll find some of the best of this month’s free offers and discounts. Keep in mind that deals often crop up at the last minute, especially with the many frivolous food “holidays.” So bookmark this page for updates on free pizza (Feb. 9), frozen yogurt (Feb. 6), and far more. Romantics will spend the first two weeks of February preparing for Valentine’s Day, while the less romantically inclined will spend that time trying to figure out how to avoid the holiday. On Valentine’s Day proper, Auntie Anne’s shops are offering a “buy one, get one free” deal on special heart-shaped pretzels. 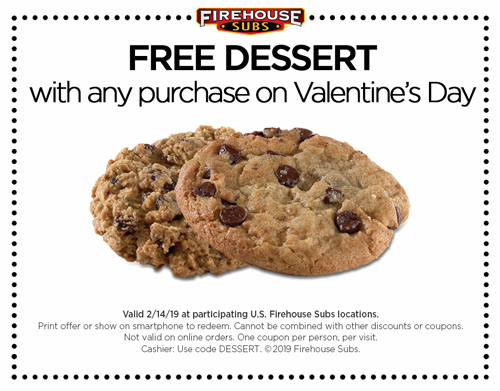 Buy anything at a Firehouse Subs on Feb. 14, and you can add a free dessert with this coupon. Head into a Potbelly sandwich shop, mention that you’re unattached, and collect a free cookie. McDonald’s is rolling out donut sticks on Feb. 20, but lucky breakfast goers in Cenral Florida can pick up a free one on Valentine’s Day from 5 a.m. to 11 a.m.
At QDoba Mexican Eats restaurants, you can score a free entrée on Valentine’s Day when you order another entrée and kiss anyone or anything (it’s the annual “QDoba For A Kiss” promotion). If you’re among the first 1,000 ice cream lovers to visit the Halo Top Creamery website on Valentine’s Day, you can win a free box of their new mini ice cream pops (shipping included). Mourning a breakup? For several years running, Hooters has given away 10 free chicken wings on Valentine’s Day to anyone who brings in a photo of ex-flame to shred, and the deal is back again this year—keep an eye on the hashtag #shredyourex. In a bit of counter programming, Mrs. Fields is celebrating Singles Awareness Day, the holiday created as an equal-and-opposite reaction to Valentine’s Day, with 20% off cakes using the code “HEART” through Feb. 2. Finally, in a rare non-food giveaway, Spotify has a special 60-day free trial for its Spotify Premium service in honor of Valentine’s Day (then it’s $9.99 a month). On a less frivolous note, February is Black History Month, and museums across the country are running special exhibits and offering free entry (check your local museum for details). From Feb. 1 to Feb. 7, you can try to catch a free screening of the Oscar-nominated movie Black Panther in 250 AMC theaters across the country (space is limited, so tickets may go fast). Food and drink discounts abound during this national celebration of contact sports, splashy half-time shows, and super-special TV commercials. As for freebies, you can find those too. If the game goes into overtime—which after two overtime conference championship games doesn’t feel like a long shot—Buffalo Wild Wings will give out free wings on Monday, Feb. 18. And if either team returns an interception for a touchdown, you can pick up a free sausage biscuit from Hardee’s between 7 a.m. and 10 a.m. on Friday, Feb. 8. At El Pollo Loco, which has restaurants in California, Texas, Arizona, Nevada, and Utah, you can add a free order of chicken nachos with any family meal. February is a busy month on the food holiday circuit, and these special days are often a hook for freebies and discounts, many of them hyper-local. A short list includes: National Tater Tot Day (Feb. 2); National Ice Cream for Breakfast Day (Feb. 2); World Nutella Day (Feb.5); National Drink Wine Day (Feb. 18, not to be confused with National Wine Day in May); National Sticky Bun Day (Feb. 21); and National Tortilla Chip Day (Feb. 24). National Frozen Yogurt Day on Wednesday, Feb. 6 is shaping up to be a sweet one. At TCBY, which has more than 350 stores around the country, your first 6-ounce frozen yogurt is free all day. At Yogurtland locations—there are more than 300 in the U.S. and overseas—it’s buy one, get one free from 2 p.m. to 7 p.m. if you go with one of their two new flavors (peanut butter cup and chocolate toffee bar). The chain 16 Handles, with stories in New York, New Jersey, Connecticut, Florida, Maryland, and Massachusetts, is offering rewards members up to 3 ounces of frozen yogurt for free. To join, download the app. At the California chain Menchie’s, it’s buy one, get one free. February is a busy month on the food holiday circuit. Once you’ve had your fill of fro-yo, keep an eye out for National Pizza Pie Day deals on Feb. 9 (also known as National Pizza Day). Already, the Knoxville, Tenn.-based chain Pilot Flying J has announced free slices for an entire week (Feb. 3 to 10) if you place your order using its app. San Francisco’s Round Table Pizza, for its part, is marking the occasion by donating $1 for every pizza purchased on Feb. 9 to The Leukemia & Lymphoma Society and giving customers a coupon for a free personal pizza on their next visit. Last year for National Margarita Day (Feb. 22) Bahama Breeze offered $2.22 margaritas (not free, admittedly, but close) on what might be considered the restaurant chain’s most revered holiday. Though not in honor of a national holiday, Wendy’s is offering free Baconator sandwiches through Feb. 4 via doordash.com or the Door Dash app when you spend $10 on something else and use the code FREEBACONATOR. Del Taco, which has restaurants in Michigan and South Carolina, is offering up two free tacos when you download the restaurant’s app. You can learn about various Asian cultural traditions with free admission to Boston’s Museum of Fine Arts’ Lunar New Year celebration on Saturday, Feb. 9. Chances are you can find a celebration in your community. As for freebies, Godiva chocolate will throw in five elegant Lunar New Year envelopes when you buy one of their special Chinese New Year collections of sweets. If you’re lucky enough to be in Southern California the first weekend of the month, you can enjoy free admission to more than three dozen area museums as part of the SoCal Museums annual Free-For-All-Day. Of course, with the L.A. Rams in the Super Bowl on Sunday, you may have the galleries to yourself. National Lash Day falls on Feb. 19, and last year MAC Cosmetics gave away free mascara to celebrate—keep an eye(lash) out for similar deals in 2019. Speaking of MAC, the brand is offering $25 off a purchase of $75, or if you spend $100, receive a free full-size eye shadow palette (a $32 value). Carrying over from January, Olay Whips will send you free samples of its eye gel and cleansing cloths if you register for the company’s mailing list. Spend February getting lost in your favorite musician’s discography. Pandora is offering a 60-day free trial for its premium service, while Verizon customers with unlimited plans can take advantage of a six-month free Apple Music subscription. YouTube Music is also offering a one-month free trial to new users. As with most subscriptions, once your free trial expires you’ll be charged for the service, so remember to cancel if you’re not interested in a long-term paid commitment. After all, what you really like is free.